GEORGE [H.W.] BUSH has the distinction of introducing the only tax issue into this fall’s Presidential campaign. For anyone whose interest in government or economics goes beyond personalities, taxes are endlessly fascinating. The power to tax is the power to destroy – and also the power to create. It is a sign of the shallowness of our society that the eyes of so many people of all ages and both sexes glaze over when the subject comes up. It is a sign of the shallowness of Bush’s understanding – or the deviousness of his intentions – that he wants to upset one of the best features of the 1986 tax law, which treats capital gains as ordinary income. He wants to tax them at 15 per cent – the lowest rate since the grand Depression days of Herbert Hoover. A tax – the StampTax – crystallized the colonists’ dissatisfaction with England and led to the American Revolution. Another tax – the so-called Tariff of Abominations – led to the nullification crisis of 1832, and ultimately to the American Civil War. In both cases much more than taxes was involved; yet taxes were central issues in the great wars that made and preserved our nation. Taxation can serve one or both of two purposes: It can raise revenue to pay the costs of government, and it can encourage or discourage various activities. The Revolution was fought (in part) because the Stamp Tax did the former, the Civil War (in part) because the tariff did the latter. In 1767, John Dickinson wrote in the second of his Letters from a Farmer in Pennsylvania that before the Stamp Tax, taxes “were always imposed with design to restrain the commerce of one part that was injurious to another, and thus promote the general welfare. The raising of a revenue thereby was never intended.” In contast, in 1832, South Carolina passed its Ordinance of Secession that denounced the tariff because of “bounties to classes and individuals … at the expense of other classes and individuals,” and espoused the theory of taxation for revenue only. 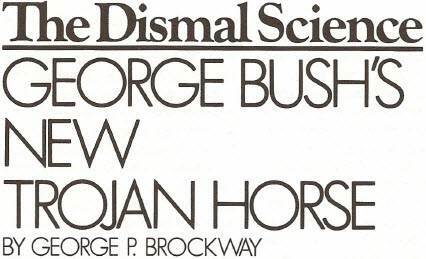 All three of these theories are involved in Bush’s tender concern for capital gains. Of the three, he has pushed most strongly the one dealing with revenue. In this he is supported by Treasury Department Research Paper No. 8801, “The Direct Revenue Effects of Capital Gains Taxation,“ which argues that a lower rate brings in higher revenues. There are opposing views, specifically those of the Joint Committee on Taxation and the Congressional Budget Office. And much private ink has been spilt on both sides. On one level, the question is an extreme case of that raised by the Laffer Curve, and of Peter Peterson‘s claim that the rich pay more taxes when the rate is lower (see “In for a Penny, In for a Pound,” NL, June 13). The case is extreme because Bush’s proposal would cut the capital gains rate roughly in half, requiring capital gains “realizations” to double just to keep revenues running in the same place. The latest figures the Treasury research paper gives us to work with are those of 1985, when the marginal rate was 20 per cent, capital gains realizations were about $169 billion, and the revenue raised was about $24 billion. Since 20 per cent of$169 billion would be almost $34 billion instead of $24 billion, it is obvious that the capital gains tax, even though admittedly mostly falling on the superrich, was paid by many whose Adjusted Gross Income was less than the $175,251 then needed to boost a married couple into the top bracket. Obviously, too, once the new tax law settles down and a married couple with an Adjusted Gross Income of $29,751 finds themselves in the top bracket (28 per cent), practically everyone with any capital gains will be paying the top rate. Neither you nor I nor even George Bush knows what the future will bring. It is probable that realizations were up in 1986 and down in 1987. A large part of what was realized in 1986 (including everything I cashed in) was in anticipation of 1987’s higher rates, while a large part of what was realized in 1987 was losses in the stock market’s Oktoberfest (me, too). It is likely that realizations this year will be greater. No matter: For Bush’s scheme to work, they must more than double what they otherwise would be. The question I ask is: Do we want that to happen? To answer that question we have to look at where capital gains come from. They come about in two ways: (1) a company retains and reinvests its income instead of paying it out in dividends, thus increasing its net worth and, presumably, the market value of its shares; or (2) goods (especially real estate and works of art) increase in value because of market shifts or inflation, thus tending to lock holders into property they might otherwise have wanted to sell. It is received doctrine that the first method should be encouraged, and that adverse personal consequences of the second should be mitigated; hence the special treatment of capital gains. In Britain, and generally on the Continent, they are not taxed at all, making George Bush more moderate than he may find congenial. A company that reinvests its income grows. The more companies grow, the more the economy grows: more goods, more jobs, more profits. Assuming that for a given company expansion makes sense, the necessary capital can be raised by borrowing, by selling new shares of stock, or by retaining earnings. Interest payments on borrowings are a deductible business expense, while dividends on stock are not. On the other hand, interest payments are a fixed expense, while dividends, again, are not. Balancing the foregoing considerations, a fairly prudent and sanguine management will opt for borrowing, but a company that can satisfy its stockholders with capital gains will enjoy the best of both worlds by relying on its retained earnings. In addition, it is said that the possibility of capital gains attracts both entrepreneurs and investors to new businesses, which are the economy’s hope for the future. Since retained earnings are rarely enough to do the job for a rapidly growing concern, its real choice is between issuing new stock and shouldering new loans. There would be no problem at all if interest payments were not a deductible business expense. The 1986 tax law has partially eliminated it as a personal deduction. I’ve made the case for eliminating it for business, too (see, “A Tax Increase by Any Other Name,” NL, November 24, 1984) and shall only outline it here. In brief, the deduction, although it seems to subsidize the borrower, in fact subsidizes the lender. Without the subsidy, interest rates would have to fall, because few could afford the raw rate. Moreover, the subsidy is meaningful only to an already profitable company, given that a new enterprise typically operates at a loss for some time and can’t afford to borrow at all. It has no net income from which to deduct the interest expense, and therefore has to pay the usurious raw rate on whatever it borrows. In sum, if you want to encourage new enterprise, you will eliminate the deduction for interest expense and will consider the treatment of capital gains more important for personal than for business finance. DOES IT, then, make sense to encourage individuals to seek capital gains twice as eagerly as they seek earned income? What is actually encouraged, of course, is wheeling and dealing. It is not impossible that some good enterprises are thus sponsored that would not have been undertaken otherwise; but it is quite certain that wheeling and dealing raises the cost of capital for all enterprises, new and old, good, bad and indifferent. It is also certain that, whatever the ills we have recently been suffering, they were not caused by a lack of wheeling and dealing. Any attempt to offset the general effects of inflation, however, winds up by encouraging it. Conservatives of Bush’s school colors are quick to see that wage increases tied to the cost of living are inflationary. The same is true of capital increases. As a matter of fact, capital increases are even more inflationary for reasons we’ve previously discussed (see “Vale, Volcker,” NL, June 1-15, 1987). The very possibility of capital gains stimulates the frenetic search for more of them; it’s easier than working. Indeed, it is precisely this frenzy that Bush wants to stimulate. As the Treasury has told us, capital gains realizations in 1985 were $169 billion. On the same realizations, the present rate of 28 per cent would yield $47 billion, and Bush’s rate of 15 per cent would yield $25 billion. For Bush to bring in more revenues than the present rate, he would have to push realizations beyond $340 billion, or more than twice the highest they’ve ever been before. Since 1966, capital gains realizations have steadily increased, from $31 billion ($67 billion in 1985 dollars) to the present. It happens that, as Professor Hyman P. Minsky points out in his recent book Stabilizing an Unstable Economy, since 1966 “the American economy has intermittently exhibited pervasive instability.” While not necessarily conclusive, the association of these facts is at least suggestive, especially when you remember that instability is another name for the volatility that comes with wheeling and dealing. Bush deserves a good mark for daring to talk about taxes. But he has offered us another Trojan Horse to make the rich richer. Let’s suppose he succeeds and manages to boost capital gains realizations to $340 billion. Then the after-tax income from capital gains would leap to $289 billion-more than double that of any previous year. As we said in discussing Peter Peterson’s ideas of taxation, this is the way multimillionaires are made. Editor’s note: The name of this article in print is “The Bottom Line on Tax Reform.” From time-to-time the New Leader replaced the author’s title with another. This is one case. THE SOCIAL SECURITY system is again in the news. Maybe “still” rather than “again.” A decade or so ago a radio chat-man named Ronald Reagan advocated making the system voluntary and throwing it to the private insurance companies. A few years later budget-cruncher David Stockman scared us into thinking bankruptcy was imminent. A few months ago Peter Peterson warned that it was promoting (or maybe he was promoting) an intergenerational war. Now Morgan Guaranty Trust writes its customers and Walt W. Rostow writes the New York Times and Daniel Patrick Moynihan writes his constituents to celebrate the burgeoning of the Social Security surplus and to propose things to do with it. And all the while candidates for high office solemnly reiterate that the system, although much changed in the past, cannot now or ever be changed again. These various reactions are facilitated by the fact that Social Security is a horse designed by a committee. It is part employment tax, part endowment, part social welfare. The tax is fantastically regressive: Workers below the poverty level pay a geometrically higher share of their income than does Peter Peterson. The tax is also heavily anti employment and especially adverse to entry level employment. What to an employee is the minimum wage less 7.51 per cent, to the employer is the minimum wage plus 7.51 per cent. The endowment is creakingly antifeminist: A wife whose lifetime earnings were greater than her husband’s, provided both contributed the maximum, receives no greater benefits than if she had earned nothing and paid no taxes. The social welfare benefits are skewed in favor of the middle class: The poor are confirmed in their poverty. Beyond the foregoing, the system is apparently too complicated to explain to anyone except, perhaps, another computer. For several years I have been trying to get someone to tell me how my benefits are calculated. I have applied either by mail or in person or both to six Social Security offices (Peekskill, Mt. Vernon, White Plains, and Lake Success, New York; Atlanta, Georgia; and Sarasota, Florida), to four congressmen (Richard L. Ottinger and Joseph J. Diogardi of New York, Connie Mack III of Florida, and a committee chairman whose name I forget), and to the author of a reputedly authoritative book (Professor Walter D. Coles, who asked me for information, which I supplied, but was evidently unable to return the favor). None of them knew how the calculations are made, and none was able to find out. If after a hard-seat wait of an hour or two you get to talk to someone in a Social Security office, you’ll be offered a nicely printed table showing what your benefits will be should you retire tomorrow. Although no one will be able to tell you how the table was constructed, at least you’ll have something to compare your benefit checks with. Apparently I am special, starting with the date of birth and ending with my date of retirement, for no one knows what to do about me. Since my benefits have twice been “corrected” without explanation, I find it hard to trust that the system is always accurate. Trust is crucial for civilized society, but the Social Security Trust Fund is misnamed, and not merely because of its surrounding cocoon of secrecy. In a rational society, Social Security would not pay different amounts to different people, would not be supported by a separate tax, and would not be funded. It would treat all citizens equally, would be supported out of the general revenues, and (given that the “risk” is level over a fairly long term, and therefore is predictable) would be treated as a current expense. The Social Security law was not passed by a quite rational society, however. We had what James MacGregor Burns analyzed as a four-party system: Presidential Democrats vs. Congressional Democrats vs. Congressional Republicans vs. Presidential Republicans. That “Deadlock of Democracy,” as Burns called it, produced the Social Security Trust Fund. Liberals wanted it because they feared that whenever conservatives got control of the government, benefits would be cut or eliminated. Conservatives wanted it because the payroll tax that supports it is far more regressive than the income tax. The liberal mistrust continues unabated. The conservative mistrust has grown as the fund has grown; the dread is that liberals will find a way of using it for the public good. Morgan Guaranty Trust Company has a way to allay the dread: partial privatization. Workers would be allowed to divert about a fourth of their Social Security taxes into something very like the IRAs that were once going to make us all rich. The diversion would “boost the United States net saving and investment rates, perhaps to as much as 8 per cent of GNP.” In full bloom, the scheme would give bankers and brokers close to $200 billion a year to play with. That sure sounds like fun, and it is poetically proper that the proposal should come from a firm bearing the hallowed name of Morgan. The elder J. P. Morgan was the central figure in Louis D. Brandeis‘ Other People’s Money (see “Junk Bonds and Watered Stock,” NL, March 24, 1986), yet even he was not so clever as to get the government to collect other people’s money for him. Walt Rostow’s notion is similar in that he wants the surplus invested in private enterprise; it is different in that he would have the government do the investing, via something akin to the Reconstruction Finance Corporation. Walt was widely admired on Wall Street for his position on Vietnam, but he won’t make friends down there with this idea. How can a plan be any good if it doesn’t provide bankers and brokers with commissions and underwriters’ fees? Senator Pat Moynihan’s proposal is characteristically “realistic.” I put “realistic” in inverted commas because I don’t want you to think I consider it desirable or smart. The Senator ranks at the top for honesty, decency, candor, and a witty literary style. Alas, those rare and valuable qualities don’t guarantee the invariable soundness of his ideas. He already takes credit for having seized on a suggestion of Senator Bob Dole‘s and organized with him a series of semisecret meetings involving Republican Congressman Barber Conable (now head of the World Bank), White House aide James Baker (now George Bush’s campaign manager), and the aforesaid David Stockman. Together they worked out the “reform” of 1983. I don’t suppose anyone would dare to insult any of Moynihan’s companions by calling him a liberal, and the outcome of their meetings was not liberal, for it entailed substantial hikes in Social Security taxes as well as some cuts in benefits. Thus was Social Security saved from bankruptcy. Oddly enough, the Senator acknowledges that it was not really facing bankruptcy. The claim was merely another of Stockman’s imaginative ghost stories. And when the actually solvent system received a great influx of new tax money, the trust fund of course started to grow very rapidly. In his recent “Letter to New York,” the Senator estimates the current growth at “$109,440,000 a day and rising.” The total is now approaching $100 billion; it is expected to reach $1.4 trillion in the year 2000 and $4.5 trillion in 2010. I assume the Senator means current dollars, but still, Wow! Readers of my July 13-27, 1987, column (“Much Ado About Saving”) will know why I don’t consider saving a rational or even a feasible objective of public policy, and readers of my October 5, 1987, column (“Of Taxes and Deficits“) will know why I consider some sort of national debt desirable. Saving is a residual, not a target; and without a national debt, the only money will be paper issued by private people and corporations. There are several other suggestions for the surplus. One would use it to bolster the hospital insurance part of Medicare, said to be in even worse shape than the Old Age, Survivors and Disability Insurance Fund was claimed to be. Another would use it to balance (or overbalance the budget, and thereby permit the rehabilitation of people, bridges or battleships, depending on your taste. A third would use it to reduce other taxes. 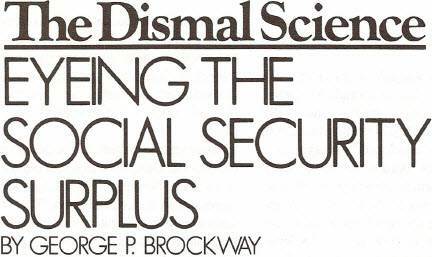 Hardly anyone is giving a thought to the truth that the miraculous Social Security surplus is the consequence of an absurdly high and shockingly regressive tax imposed because of a blind panic induced by deliberately false information. Barry P. Bosworth, a senior fellow of the Brookings Institution, puts it succinctly: “We are not, in fact, saving the Social Security surplus; we are simply using a system of regressive wage taxes to finance general fund outlays that were formerly financed with the personal and corporate income taxes.” As the law now stands, Social Security has been transmuted into just another system for taking more from the poor in order to leave more for the rich. It is unseemly for Senator Moynihan to be so proud of his part in the scam. If he really thinks that reducing the budget deficit and the national debt is the road to prosperity, he would be well advised to search for ways to make the rich contribute their share and not rest smugly content with a system that takes a far higher percentage of a day laborer’s wages than of the seven-figure salary of the CEO at the company that occasionally employs him – a system, moreover, that taxes you only if you work and not at all if your economic endeavors are limited to cashing your dividend checks and clipping your coupons. Editor’s note: The name of this article in print is “Bad Ideas from Brookings.” On occasion The New Leader changed the title from that submitted/suggested by the author. This is one case. IT LOOKS as though they’re going to try putting “circuit breakers” on the securities and futures markets. I’m not sure it will make much difference. The question, after all, is not whether stopping trading for an hour or so after a fall of 250 points would stop or accelerate the plunge. (It might very well do one thing one day and the opposite the next; there are plausible reasons either way.) No, the question is: What is the use of a market that can crash and lose 30 per cent of its value in a single hectic day, and that can routinely lose or gain 2-3 per cent in a couple of hours? What do we have securities markets for anyhow? The reasons ordinarily advanced are two: (1) to provide financing for productive business and industry, and (2) to encourage people with a little money (or a lot) to participate in the financing. As to the first point, the New York Stock Exchange won’t even bother answering your letter if you ask them how much of their trading is in new securities issued to finance growing business. Probably they don’t know, and certainly they don’t care. As to the second point, today’s lament on Wall Street is that the small individual investor (that is, anyone having less than, say, $10 million to play with) has stayed, as the current metaphor has it, on the sidelines since the 1987 Crash. They’ve stayed out of the game, not for lack of coaches eager to send them in, but because of a prudent aversion to a playing field that sometimes resembles a mud slide. In short, the pretended justification of the New York Stock Exchange is a sham – and the same goes for all the others, foreign and domestic. They do not in fact provide much financing for new enterprise; they do not in fact significantly facilitate individuals’ participation in such financing; and whatever they do could be easily and far less expensively organized otherwise. If there is no justification for the stock exchanges, there is certainly none for the futures exchanges that are based on them. 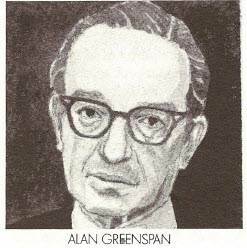 Federal Reserve Board Chairman Alan Greenspan thinks these things are justified because people use them; the same argument can be made (and I’ve heard of some who have made it) in support of astrology. Ironically, the exchanges’ own supporters make an air-tight case against them. Look, they say, the Crash didn’t hurt anyone, except for a few foolish widows and orphans. Milton Friedman understands us when he says, “Easy come, easy go.” Six months after the Crash, they say, the markets were about where they had been six months before it. The Great Reagan Recovery is jogging along as if nothing happened: GNP up about the same, inflation about the same, the deficit about the same. Lots of banks may be in trouble, but not because they were involved, directly or indirectly, in the market. A trillion dollars, more or less, disappeared overnight, they say, yet it was only paper profits anyhow. Now that the hysteria has subsided, you can see that the whole uproar didn’t make any real difference. Since it didn’t make any real difference, they say, there’s no need to do anything. I say that since it didn’t make any difference, there would be no harm in trying to prevent a plunge from happening again, if only to protect the widows and orphans. The Crash (the biggest ever) had no substantial effect on the producing economy because the damage had already been done. The trillion dollars was really lost and it is a lot of money almost as much as the Reagan increase in the public debt (or, to put it another way, almost as much as the Reagan tax cuts). The enormous loss didn’t matter to the producing economy only because the producing economy never had the use of it. The money went directly from the happy beneficiaries of the Kemp-Roth tax bill into Wall Street and then down the drain. Of course, some of the tax cuts went into consumption, and some into government investment (bonds to pay for the deficit), and even some into private enterprise. On balance, though, it was the long bull market that started in 1982 that was created by the tax cuts. To be sure, there were other unfortunate things going on simultaneously (mainly former Fed Chairman Paul A. Volcker‘s love affair with double-digit interest rates); but if there had been no tax cuts, there would have been no bull market. You can see why most people who lost money in the Crash (other than the few widows and orphans) have shrugged it off. What they lost was tax money. So they’re no worse off than they would have been if Ronald Reagan hadn’t been elected; and it sure was fun while it lasted. Yet these people are citizens, too. They are not merely private atomistic profit maximizers and utility maximizers. As they complain to each other at bars and over bridge tables, they’re weighed down by their share of the public debt. Considering that upwards of 35 million people are living in poverty and that many millions more make so little they pay practically no income taxes, each family of the sort of citizens we’re talking about can actually claim liability for close to $100,000 of the public debt, and perhaps more. Besides, the pundits tell us the debt is to blame for all our troubles. Thus if Milton Friedman was right when he said, “Easy come, easy go,” he was also right when he said, “There’s no such thing as a free lunch.” The excitement of the bull market and the titillation of the Crash were not free; they were paid for by doubling the public debt. If our tax system were fair, we might say that, in general, the people who had fun in the market are also the people who assume the debt burden, and therefore, again, the whole roller coaster didn’t make any difference. Aside from fairness, the trouble with such a conclusion is that those tax dollars, like all dollars, come ultimately from the producing economy. No economy can run on securities alone, because stock certificates are not good to eat or wear; and while they’ve sometimes been used to paper walls, they don’t provide much shelter. Wealth is the result of the work of producing, for which people are paid in the form of wages, salaries, interest, rents or profit. The government, too, is a prolific and necessary producer, mainly of services, for which it is paid in the form of taxes. The way conventional economics has it, as soon as people get paid for something, they buy something with their pay. The people they buy from do the same, and so on and on. Except for a little friction, this producing and buying and selling goes on steadily, to everyone’s benefit. The economic system is in perpetual motion, and also in perpetual equilibrium. There is really no way for anything to go seriously wrong. Yes, so long as people are buying and selling goods and services- that is, trading in commodities. But when they are buying and selling claims on capital (in the stock markets), or money or options to buy or sell money or capital (in the futures markets), they are not dealing in commodities; they are speculating in the conditions that make commodities possible. The money absorbed by the speculating economy is money earned by the producing economy that is no longer available to participate in the production of goods and services. The more money goes into speculating, the less is available for producing. Consequently fewer things are produced, and fewer people have jobs producing them. The conventional economists’ happy cycle of buying and selling is shrunk and bent out of shape and may be fractured. Since the speculating markets not only fail to assist the producing economy but actually hurt it, you might think it would make sense to go beyond regulating them and shut them down altogether. IN HIS MOST informative new book, Markets: Who Plays, Who Risks, Who Gains, Who Loses, Martin Mayer shows repeatedly how the exchanges have been able to make a mockery of the relatively innocuous rules we tend to think are in force. The Federal Reserve Board, for example, is said to set the margin rate (that is, the amount you can borrow to buy stock) at 50 per cent. If you ask me, it ought to be zero; but it doesn’t matter, because only the littlest millionaires are affected, and all the really big operators have easy ways to get around it. Given the radically reactionary interests now ruling the Federal Reserve Board, the Securities and Exchange Commission, and the Commodity Futures Trading Commission, there is no real possibility of rational control of the speculators for years-or until the next crash. So why not consider abolition? Naturally, there would be a great debate, or at least, a lot of talk. One of the points that would be made is that shutting down the exchanges would simply send them scuttling abroad. (The same threat will be made whenever rational control is proposed.) New York City is sadly aware that even trying to get the exchanges to carry their share of the tax load is immediately smothered by threats to move to the New Jersey meadows. The wonders of the computer age being what they are, it would not be much harder to set the whole thing up on Grand Cayman Island or Singapore. Beyond the damage to our pride (equivalent to losing the Winter Olympics), would not the flight of the exchanges be accompanied by a flight of capital, and would not that be our ruin? It is said that the flight could not be prevented. Complete prevention would no doubt be impossible, just as perfect income tax collections are impossible; but perfect flight wouldn’t be possible, either. In any case, the fleeing capital would merely be money. It wouldn’t be factories or warehouses of goods for sale or goods in the process of consumption. And since the money that would flee isn’t doing anything in our producing economy, its loss wouldn’t change anything that matters. There is, however, a much simpler and fairer way to control the markets. As we’ve said here before, speculative binges occur only because some people have more money than they know what to do with. When we had steeply progressive income taxes, there were many fewer such people (as well as many fewer living in poverty). The markets then were too viscous for wheeler dealers but certainly liquid enough for ordinary purposes. We could do worse than learn from our past success. LAST OCTOBER, just before the stock market crash, one Peter G. Peterson had an article in the Atlantic that caused a lot of talk on commuter trains. Peterson was President Nixon’s Secretary of Commerce in 1972. He astutely left the Cabinet the following year, and since has been an investment banker as well as a tireless agitator in the press and on TV. He was as responsible as anyone for the 1983 boost in Social Security taxes and the partial tax on Social Security benefits. He continues to talk darkly about “entitlements,” to warn that universal medical care will be the death of us, and to plead for a tax on consumption. By an aberration of my W. C. Fields like filing system, I can lay my hands on one, but only one, set of old tax instructions. We can make do, however; it’s the top bracket Peterson is talking about, so we’ll talk about that too. When we mention the incomes of the wealthy, we’ll mean just the part of their incomes that is taxed at the top rate-70 per cent or 50 per cent, as the case may be. It will be convenient to have a standard of wealth. Peterson doesn’t give one, but let’s guess that to count as wealthy in his book, one has to have $200,000 in the top bracket. We also need some ground rules. I’ll name two: (1) The differences we’re going to consider will not have anything to do with tax shelters, because Peterson speaks only about the tax rate, and anyhow shelters are greatly restricted by the new law; and (2) inflation won’t have anything to do with our calculations either. We want a level playing field, as the Wall Street Journal would say. Now, as I read Peterson, he seems to be saying that if you take all the $200,000-and-up incomes as above defined, add them together, and tax them at 50 per cent, you will collect more taxes than you would if you taxed them at 70 per cent. That’s too preposterous for anyone to believe; surely Peterson must have meant something else. Let’s explore the possibilities, for he seems to think he’s hit upon a great social truth. We’ll start with a little algebra. We will call x the amount taxed at 70 per cent, and y the amount taxed at 50 per cent. Then if taxes paid in the two years are equal, our equation would be .7Ox = .50y. Solving the equation for y, we have y = .70x/.50, or l.4x. In other words, the amount taxed at 50 per cent would have to be at least two-fifths greater than the amount taxed at 70 per cent. The mathematics is unimpeachable, but perhaps Peterson is focusing on something different. Low rates are often said to take the incentive out of cheating on taxes. I’m no economic determinist, so I don’t hold with that. Indeed, in spite of recent studies funded by the IRS, I’ll stand right up and say that half of the wealthy taxpayers are honest. And why not? As the chorus sings in Iolanthe, “Hearts just as pure and fair/May beat in Belgrave Square/ As in the lowly air/Of Seven Dials.” Then for every honest wealthy taxpayer who reported an income of $200,000 in both years, there would have to have been a wealthy cheat whose income was really $360,000, who didn’t report $160,000 of it when the rate was 70 per cent, but who cheerfully reported it all when the rate fell. In that way, the wealthy as a class would report 1.4 times as much at the lower rate as at the higher, and the total taxes paid by them would remain the same. Let’s try another approach. It has been said at least since the New Deal days that high taxes sap the incentive of producers to produce. After a certain point, they are supposed to get tired of working for Uncle Sam; so they quit working, or maybe take longer lunch hours. This is thought to be bad for everyone because these people are, by definition anyway, the most productive among us. We should try to get them working again by allowing them to hold on to more of what they get their hands on. To keep a level playing field, we’ll consider only what is called earned income, for increased interest or dividends or rents would go also to remittance men, who know nothing of incentives since they do nothing anyhow. To be sure, our big- time producers are used to getting much of their income from stock options and such, but the 1986 law, by taxing capital gains as ordinary income, has largely eliminated that particular incentive. Although the morals are slightly different, the mathematics of the incentive argument is the same as the mathematics of the cheating argument. So I ask: Does Peterson mean that our can-do people will increase their doings by 40 per cent just because the tax rate has been cut? Does he want us to believe that they’re doing whatever it is they do without half trying? Does he think it honorable of them to have done this (quoting Iolanthe yet again) “By taking a fee with a grin on [their] face/When [they] haven’t been there to attend to the case”? Or put it this way: If they lack incentive to do what they’re supposed to, why don’t they get out of the way and let someone else do it? Well, I’ll make another guess at what Mr. Peterson meant. Maybe he’s saying the incentive of a lowered tax rate will boost thousands of people from the $150,000 class to the $200,000 class, which would now have more members and consequently a higher total income. This explanation is more plausible than the others, and there actually was a highly unrepresentative sample of its possible effect in the sports pages of the Times the other day. Last year, when the tax on the wealthy was, well, too complicated for me to explain, there were five ballplayers with annual wages in excess of $2 million. This year, when the rate is somehow lower, there are 10 in the golden circle. With twice as many making $2 million, their rate could fall in half, and the total taxes paid by those poor chaps would remain about the same. Is this what Mr. Peterson meant? If so, he didn’t mean much. The five new boys were all making well over a million last year; so it took only raises of a few hundred thousand to double the number of players in the $2 million bracket and thus double the taxes paid by the superstars. This is what is known, among less exalted players, as bracket creep and is mostly due to inflation, which we agreed to rake out of our playing field. BUT IT DOESN’T really make any difference what reason Peterson gives for the behavior of the wealthy. The fact remains that if they paid more taxes after a 50 per cent rate than they did after a 70 per cent rate, their marginal-rate income had somehow to go up at least 40 per cent. A $200,000 income taxed at 70 per cent had to become at least $280,000 taxed at 50 per cent. And that’s not all. Their pretax income went up at least 40 per cent. But their after-tax income jumped 233 per cent, from $60,000 to $140,000 (and under the new tax law will jump again -to $190,000 or more). Peterson is a great sleight-of-hand artist. He wants us to keep our eyes on the taxes paid, and not notice the jump in disposable income. This is the way multimillionaires are made. As the tax rate was cut, there came a great leap forward of executive salaries and perks, of lawyers’ fees and doctors’ fees, of tax shelters and arbitrage deals, of interest rates and capital gains. These leaps account for the tax collections Peterson celebrates. There weren’t any million dollar-a-year ballplayers before the cut, and few others with that kind of income. By 1985 (the latest figures in Statistical Abstract of the United States) there were some 17,000 Americans in that fast-growing class. As Phil Rizzuto would say, that’s not too shabby. On another level, it’s very shabby indeed. For if Peterson is right in his figures even though vague in his reasons, the maxitax cuts gave enormous gifts to the wealthy and nibbled away at the incomes of everyone else. Now, I’m going to throw a lot of figures at you to show you what’s happened in the past 10 years, and I beg you to be careful how you use them. They come from Economic Report of the President, 1988. Some are in 1986 dollars, some in 1977 dollars, and some in current dollars, but within each category the figures are comparable. First, remember the poor. In 1977 there were 5.3 million families, or 31.7 million people, living in poverty. By 1986, the numbers had risen to 7 million and 34.6 million, respectively. Next, look at average weekly nonagricultural, nonsupervisory earnings (1977 dollars). In 1977 they were $189.00 and had fallen to $169.28 by 1987. The average annual earnings of the lucky ones who worked a 52-week year were $9,828 and $8,802, respectively. The 1977 figure was slightly above the poverty level, the 1987 figure considerably below it. Of course, those who didn’t work full time didn’t do so well. Then consider the median family income (1986 dollars). This was marginally up, from $28,966 in 1977 to $29,458 in 1986 (latest figures available). Note that a two-earner family, working full time, wouldn’t come close. Finally, consider the after-tax income of the median families (this is where the wealthy shone like burnished gold). In 1986 dollars it fell, from $25,443 in 1977 to $24,095 in 1986. When you include the increase in Social Security taxes (largely engineered, as aforesaid, by Peterson), the fall was much greater. In short, from 1977 to 1986, poverty was up a third; weekly earnings were down 10.4 per cent; the median income was up 1.7 percent; but the after-tax income of the median family was down 5.3 per cent. And the after-tax incomes of the wealthy more than doubled. This is what Peterson and his ilk are fighting for. They profess to be very worried about the deficit and are ready even to admit that it grew because of the tax cuts. But they don’t propose to give up those cuts. No, they want us to put all that behind us. They want us to look ahead to a sales tax (which they call a consumption tax), because such a tax falls very little on them but very much on the middle class, especially the lower middle class, and on the poor. I think these people know very well what they do. THE OTHER DAY, in talking about profit maximization and utility maximization, we refrained from referring to their common, everyday name, which is “greed.” Conventional economics says that producers are profit maximizers and consumers are utility maximizers. We let it go at that and examined some of the logical implications of those propositions (” Serving Two Maximizers,” NL, March 7). Today, we’ll look at a few more. Ivan Boesky was not so picky. He once told the graduating class of a California college that it’s good to be greedy. Most people shrink from such bravado, especially now that Boesky’s stock market activities have forced him to take early retirement. But economists are made of sterner stuff and will, if pressed, admit and even insist that economic agents are greedy. Since everyone is some kind of economic agent-a producer or a consumer or both-they are saying that everyone is greedy. I think that is manifestly untrue. There are three possible resolutions of the issue. The most popular is to forget all about it. (This is the way ordinary people and ordinary economists handle hard questions.) The second is to claim that, whether or not people really are greedy, they act as if they were. (Even though this is the type of approach favored by Milton Friedman, it gets us nowhere because it raises the same questions of fact: Does Sister Teresa really act as if she were greedy”) The third way is what is known in mathematics and in economics as partial analysis. Many years ago when I took Latin (it would be an exaggeration to say that I studied it), I was charmed by the grammatical construction with the silly-sounding name of “ablative absolute.” One of the most famous of these is ceteris paribus–other things being equal. The phrase is invoked so frequently by economists that they often drop in its abbreviation ritualistically, as a Tibetan monk spins a prayer wheel. “Cet. par.,” they will say, and go about their business. What they are doing is holding unchanged all except one of the factors of a situation or equation, and then varying that one to see how it affects the outcome or solution. To laymen it often looks as though economists were simply shadowboxing, because other things generally are not equal; but partial analysis is a perfectly legitimate procedure, and in the majority of economic problems the only procedure. It is used all the time in business, as a means of assigning costs to different parts of an operation, deciding which advertising pitch pulls best, and so on. who may be perfectly altruistic and scornful of anything for herself, may, other things being equal be eager for more money to support her charitable causes. She won’t compromise her beliefs to get that money, but cet. par.-that is, putting those beliefs aside-she’ll go for it. And I, holier than thou though I may be, am the same. None of this is to say that Mother Teresa is greedy, or that I am or that you are. We may sometimes act out of self-interest, just as the most depraved miser may sometimes act altruistically. Other things being equal-all contrary considerations aside-the miser would be happy to be a benefactor of his fellow-men, or some of them. The same sort of reasoning applies to every honorable or dishonorable activity you can name. Aside from things I will not or cannot do, I’d rather be rich than poor (I hear that rich is better). I’d also like to be an internationally respected philosopher and a better bird watcher, have a better second serve, and (in my less wary moments) be Vice President of the United States. All of these motives are true under the partial analysis rule, and they are no less true than the fact that I am greedy. Unfortunately, we’ve proved too much. Greed can be established as a universal motive under the partial analysis rule, and only thus, but every sort of motive-including contrary motives -can likewise be established. It would be a weak and erratic economics that would be based on my second serve; yet one based on greed is in principle no better. Both can show what people do on certain assumptions; the assumptions are valid, cet. par., and so are the showings. It may be contended that some of the assumptions-the second-serve postulate, for example-have trivial consequences. But who knows? It was not until two millennia after Euclid that the implications of the parallel-line postulate began to be understood. Scientists properly insist that knowledge is good in itself, regardless of its apparent usefulness. The partial analysis rule seems to leave us in a world without form, a world where anything goes. The first thing to notice about any motive is that it implies a value judgment. A motive is not like a physical force, which acts willy-nilly; a motive is diffuse and impotent without a value judgment. Rich is better; benefiting one’s fellow-men is better; a winning second serve is better. The value judgment is certainly personal. I opt for being rich; you may judge otherwise. But it does not stop there. I cannot become rich without enlisting your support or at least your forbearance. Nor can I benefit my fellow-men if they are unwilling (there are even people who don’t read this column). And my second serve is meaningless unless you are across the net lunging desperately as it slices abruptly away. I can’t even improve my golf game unless someone maintains the course. Consequently, a motive including, of course, the economic motive- must be defined in the light of a value judgment that cannot be merely personal but has to be social as well. So we come to ethics and public policy. Economic questions cannot be posed except in ethical terms. It can be said (other things being equal) that a reduction in the supply of oil will cause an increase in its price. The effects of the increase can similarly be traced throughout the economy; and on the basis of these studies policies can be proposed and analyzed-taxation, subsidization, nationalization, conservation, or perhaps laissez-faire. It may even be assumed that the economic agents involved will act, cet. par., to maximize their gains in the short run. But the choice among policies will not turn on the relative extent of these gains, either individually or in the aggregate. The choice will turn on the national purpose, which is an ethical question and a historical question. WE AMERICANS have a tendency – often a dominant tendency – to confuse national purpose with short-term profit maximization. Perhaps the frankest statement of that confusion was Calvin Coolidge’s “The business of America is business”; but a fat anthology could be made of similar statements, both earlier and later. It would make dispiriting reading. Happily, a larger anthology could be made of inspired documents that we all, including Coolidge and his admirers, recognize as the symbols of our democracy. It is further true that there are some questions we will not submit to the market for answers. We will not buy our battle tanks from the Soviet Union, no matter how cost effective they are. We may import golf carts from Poland, but we will not buy howitzers from Czechoslovakia, even though the Skoda works has solid experience and an unexcelled reputation. We will not contract with China to supply us with Silkworm missiles made to our design and specifications, although we could thereby save half or more of the cost. Professor Frank Hahn of Cambridge replied by referring to the title of Keynes’ book and noting “the singular lack of dentists who have written ‘general theories.”” Every dentist I’ve known face to face has been full of general theories and has told me about them, but Hahn’s point is well taken, as Keynes surely would have agreed. Economics is concerned with more than the price of oil. Partial analysis can do nothing with the big questions. It is all very well to say that, cet. par., everybody is greedy. But it is very bad to conclude that the encouragement of greed is the proper objective of public policy. The big questions are ethical and historical. Whether full employment, for example, is a proper objective of public policy is an ethical question. What full employment is – should children be counted, should women, should blacks, should braceros, should strikers-is a historical question, and one whose answer has changed mightily since World War II and is still changing. This is the way it is with what we say finally matters. Those who knew the author are aware that this is the least of the reasons he could not improve his golf game…. Solow’s scheme is, as the mathematicians say, elegant in its simplicity. But I don’t think it will work, at least not if its purpose is anything other than a transfer of wealth from the middle class to the already wealthy. The scheme would bring about such a transfer; there’s no doubt of that. There would also be some leakage, as the economists say. Because the middle class’ spending money will in effect be taxed twice (once by the consumption tax, then by the interest paid on the borrowed money), spending will be reduced after all, and the proceeds of the consumption tax will be correspondingly reduced. Depending on the new interest rate, the reduction in spending could be very large-large enough to bring on another recession (if you’re timid about saying “depression”). to show that you could increase tax collections by reducing the rates, and the Kemp- Roth tax bill, which promised to increase investment by cutting taxes, especially of the rich. Those were the heady days of the supply-side theory, but investment didn’t respond as promised. What actually happened was that tax collections fell far below expectations, creating the mega deficit that was covered by bonds paying usurious interest rates, purchased by the rich with their tax-cut windfalls. In effect the rich were given the bonds, just as Solow’s scheme would give the rich the promissory notes of the middle class. It is deja vu. Indeed, it is, if Yogi Berra will pardon me, deja vu all over again: The Great Depression was also preceded by tax cuts for the rich. I do not think this is mere coincidence, or mere post hoc, ergo propter hoc. For I am persuaded that there is a fatality about economics that in the end chokes any society making too great a distinction between the rewards of the favored and of the disfavored. It is a commonplace of legal theory that a law must not only be just but also be seen to be just. It is the other way around with economics, where it is more important for a policy to be fair than for it to be accepted as fair. This is particularly true when it comes to policies determining the distribution of a society’s rewards. As near as we can tell, the Roman mob was appeased, if not altogether satisfied, by bread and circuses; but in the imperial city alone, upwards of 150,000 lived on the dole, while uncounted thousands waited upon the whims of the favored few. Labor power is the ultimate power-and Rome threw it away. In 1928, a year we look back on as a period of idyllic prosperity, almost 60 per cent of American families lived in poverty; then calculated at less than $2,000 a year. Now we have an underclass, and we have a large class of the underemployed. This costs us, and may finally destroy us; yet it would seem that substantial majorities of American voters have been satisfied with current policies. The policies are seen to be fair, but their actual unfairness may be our undoing. The rich have always had a problem knowing what to do with their money. In times past it could always be invested in land and in improvements thereon. The improvements, whether in the shape of stately homes or scientific agriculture, were craft industries. Each staircase or mantelpiece designed by Grinling Gibbons and carved by him or his apprentices was the subject of an adhoc contract between him and the lord of the manor. There certainly was demand for his work, and this certainly affected how much he could charge; he did not produce for a market, however, nor was he himself an important outlet for what was produced on the estates where he worked. The problem of today’s rich is different. In the first place, they have not become rich by investing in land-speculating in land, maybe, but accumulating rents, no. In the second place, their riches are vastly greater than the sums necessary to recreate a Chatsworth or a Montacute, should their fancy happen to take that turn. In the third and most important place, industry today is built on mass production: Giant corporations serve giant markets. The giant markets are crucial; without them the giant corporations cannot exist. Giant markets are masses of people willing and able to buy. Such masses need to include the employees of the giant corporations, and the employees are able to buy only to the extent that they are well paid. Henry Ford talked as if he understood this, but even his shockingly high wages were not enough to raise his employees out of the ranks of the working poor. In any case, his has remained a minority view among American businessmen. The majority view, in recent years embraced by the electorate at large, is that consumption should be curtailed and investment should be encouraged. IRONICALLY, consumption has nevertheless expanded as the banks have discovered profits to be made in personal loans at usurious interest rates. There are limits, though, and they have been reached in many an industry. Automobile companies struggle to maintain their share of the market, because the market is limited, and because the industry’s present capacity is much greater than the market. Steel mills, all over the world, are closed down or running at a fraction of capacity. Agriculture produces more than could be consumed even if somehow the idiocies that permit widespread starvation could be overcome. The inevitable consequence of limited markets is limited opportunities for productive investment. Hence, as we’ve remarked here before, the rich have more money than they know what to do with, and so do the massive pension and charitable funds. Besides, the glittering gains from speculating in a churning stock market are enormous. In the eventual crash the too-much money of some of the rich and of some of the funds disappears; on October 19 perhaps as much as a trillion dollars disappeared forever. The Reagan revolution created a deficit to give this money to people who couldn’t use it. The appalling fact is that practically everyone seems to want a repeat performance. 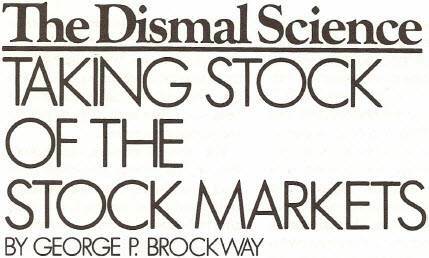 It would appear that the first eight months of 1987, when the Dow went from under 2,000 to over 2,700, was the happiest period in millions of tawdry lives. Every day the “financial” news was a joy. Individuals with a few shares of a mutual fund and college presidents with great fortunes in their care were equally delighted. Economists, who gave the stock market a prominent place in their models, looked upward. Brokers stood tall. Arbitragers stood taller. Tens of millions more, although not directly involved, shared in the euphoria. Despite the shock of October 19, these people seem determined to do it again. More stridently than ever the claim is being made that the stock market is both the heart blood and the brains not only of the national economy but of the whole free world; that our liberty as well as our prosperity depends on its ineffable wisdom; that any attempt to control it would, in the tasteless cliché, throw out the baby with the bath water. Worse, we hear again the cry to tax consumption, with the deliberate purpose of destroying the mass market modem industry depends upon-which would foreclose rational investment opportunities and bring on a new fever of speculation. Some of this can be explained as simple greed. But beyond that there is a pathological psychology whose etiology I can’t even imagine. WITH THE EXCEPTION of philosophy, all disciplines start with assumptions. I’ll be glad to discuss the exception with anyone who wants to stay after class. For now, let’s concentrate on two assumptions of economics as it is generally taught and understood. The first is that economic producers are profit maximizers. 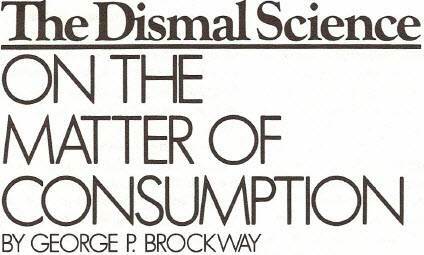 The second is that economic consumers are utility maximizers. Sometimes these assumptions are explicitly stated, as by mathematical economist Gerard Debreu, and sometimes they are accepted as too obvious to warrant discussion, as by Frank Hahn, another mathematical economist. On the other side a considerable literature exists questioning their realism. Given the enormous range and variety of what people do, not to mention the comparative effectiveness of those doings, it is argued that the multitudinous actions cannot all be examples of profit maximization. It is similarly said that the different ways we spend our money – certainly idiosyncratic, frequently wasteful and occasionally counterproductive – suggest that utility maximization is an idea without much real content. Personally, I see much merit in those objections; yet I also see force in the rejoinder that it would be irrational not to try to maximize profit or utility, as the case may be. If you can get more of either, why shouldn’t you? Indeed, since maximum profit comes from the most efficient use of scarce resources, can it not be said that you have a duty to seek it? After all, this is the way Adam Smith’s invisible hand seduces selfish behavior into producing public good. Nevertheless, I’m going to demonstrate that the whole scheme is inescapably fallacious. For look at me, a profit-maximizing man. Not only am I clever, bold and ruthless; not only do I stretch the law as far as it will go in my favor (but no farther); not only do I push my employees to the limit and deal as sharply as I can with my suppliers and my customers; not only am I admired and feared as a keen and tough competitor-beyond these delightful qualities I am necessarily a workaholic. As long as there’s another dollar-another penny-to be made, I am after it, not like a hawk (I have no time for soaring), perhaps like a weasel. If there’s no way to squeeze more out of my regular employment, I go moonlighting; and when I finally fall into bed, I lie awake a long time scheming ways to increase my profit tomorrow. Unfortunately, I never get to enjoy my winnings. I’m too busy. If I were to relax a moment, a main chance might pass me by. Literature is full of monsters like me. Dickens would have had to shut up shop if he hadn’t had such people to write about. Literature is full of utility maximizers as well-charming wastrels who live a life of endless pleasure. Women are supposed to be enchanted by them. Until very recently, women were themselves supposed to live such lives. As Thorstein Veblen saw it, only when women were successful at this utility maximizing did their profit-maximizing husbands enjoy any utility-albeit a derived utility -from the profits they piled up. So we have a conflict. A profit maximizer has to forgo utilities for lack of time. And unless a utility maximizer can manage to be supported by someone else, he (or she) will not have resources necessary to pay for possible pleasures. No producer is only a producer, and very few besides children, the senile and the infirm are only consumers. Since producers are consumers too, they must be both profit maximizers and utility maximizers, and that is impossible. Can we narrow the situation down and say that an economic agent is a profit maximizer when he is producing and a utility maximizer when he is consuming? Then we must ask why he is producing at this moment instead of consuming. Why is he moonlighting instead of gazing at the moon? If he has a job, he has no doubt accepted the responsibility of maximizing profits at certain hours of the day, but why did he take the job? Why not emulate Henry Thoreau? After all, Thoreau was an exemplary producer: Goods he created still yield profits and utilities, all over the world, a century and a quarter after his death. An obvious modification of the scheme calls for utility maximizers to do their best subject to the restraint of their wealth, while profit maximizers are clearly subject to the limitation of their abilities and their luck. Even an incompetent man may be a workaholic, however, and consequently unable to enjoy the utilities available to one of his status, while a remittance man may steal enough time from his pleasures to make a little profit for himself, just for fun. Thus the proposed constraints are, if precise, limited to a single case; or if they are vague enough to be general in application, they are also so general in implication that no useful inference may be drawn. This conclusion is not merely a rhetorical flourish. Translate your thoughts into mathematics (as you must to get ahead as an economist these days) and you will reach the same conclusion very quickly. For each assumption requires that a variable be maximized, and the variables are assumed to be independent. But you can’t simultaneously maximize two independent variables-except by happenstance. If they are always maximized together, they are not independent: One is a function of the other, or both are a function of some third. In the present case, if the variables are not independent, neither are the assumptions. One of them (perhaps both) must go. A sure way to screw up your mathematics is to make a lot of assumptions that are not necessary. The situation here, though, is not like that of Euclid’s parallel-line postulate, which was not provable from the other postulates. The parallel- line postulate led to our familiar, four-square, no nonsense geometry which is perfectly valid in its domain. The economists’ assumptions, in contrast, are mutually contradictory and lead only to confusion. It is not surprising, therefore, that in practice economists tend to forget one assumption or the other. Jeremy Bentham, the founder of utilitarianism, based his system on the “principle which approves or disapproves of every action whatsoever, according to the tendency which it appears to have to augment or diminish the happiness of the party whose interest is in question.” In our time, the producer is more likely to be emphasized. But forgetfulness of one assumption or shifting of emphasis will not do. Conventional economics is sustained by the tension between supply and demand, and they are, in turn, determined by maximization. IT SHOULD BE noted that the appropriate tension is not provided by the “minimax” of game theory, where any economic activity has a single objective and the problem is to find the best combination of possible gain with the related possible loss. Various solutions to the problem may be proposed and investigated, but they will all be ranked on a single scale. 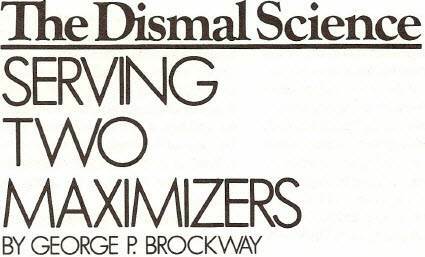 In the case of profit maximization and utility maximization, there are two scales; and even if it could be maintained that, say, for every action, the value on one scale is the reciprocal of the value on the other, the theory would still provide no basis for picking the best combination. The problem is indeterminate, and without mathematical solution, as we have seen it to be illogical and without reasonable solution. These are no mere quibbles; they go directly to the heart of conventional economic theory. Nor is appeal here being made to the realism or unrealism of the assumptions. Although such empirical appeal is not without validity, it is not being made here. Our appeal is to logic. Any theory that is illogical at the start will be illogical forever after. GIGO, as the computer people say. And it has to be acknowledged that a great deal of garbage is in fact spewed out in the form of economic talk. Consider the arguments for privatization, for revenue-neutral taxation, for ubiquitous deregulation, for indifference to industrial pollution. These all turn on the axiomatic nature of profit maximization. Consider, next, the arguments for free trade, for unrestrained competition, even for the right (as proposed by some flaky Harvard pseudo-philosophers) to decide the specific functions of government one will support with one’s taxes-and how much. These all turn on the axiomatic nature of utility maximization. So the assumptions are not innocent. But if we have to give up those two assumptions, what becomes of economics? Let’s look again at the reason for the failure of the assumptions. They seemed fair enough until we recognized that a profit maximizer must be a person, that a utility maximizer must be a person, and that in the vast majority of cases profit maximization and utility maximization must both be done by the same person at the same time. In short, persons are, as my old boss W.W. Norton used to say, the absolute sine qua non. Economics is concerned with the maintenance of persons, not simply as biological entities, but as responsible agents-that is, as doers, as actors. Since the actions of one person involve others, they have an ethical aspect. The actual first assumption of economics, then, is that it is a division of ethics. It is the division of ethics that concerns money. On this rock a system can be erected whose orientation is quite different from that of the pseudo-science resting fallaciously on profit and utility maximization.